1. P3 Project Size Favors Incumbents. Taken as a whole, these projects paint a clear picture of the likely medium-term future of P3 projects: large-value contracts for significant scopes of work. With the exception of Pennsylvania’s (comparatively) tiny $37.5 million Northampton County Bridge Renewal project, the smallest active DoT P3 project has a disclosed contract value of $560 million. These 12 projects have an average disclosed contract value of $1.556 billion. These projects illustrate something already well-known about P3 projects: they tend to be among the largest public projects in terms of contract value. However, as P3 projects become more popular and more common, the average contract value of a P3 project should decrease. The Northampton County Bridge Renewal Program in Pennsylvania is indiciative of this—ten years ago, few would have predicted a P3 project with a $37 million total price tag. And while this project will probably be an outlier for the near future, an overall trend towards smaller project sizes (smaller being relative, as the next-smallest P3 project tracked by DOT has a price tag of $560 million) should be expected. Somewhat counterintuitively, this trend will likely be most beneficial for the largest contractors, and most problematic for regional contractors. Several factors drive this result. 1. Captive Concessionaires Cut Capital Costs. 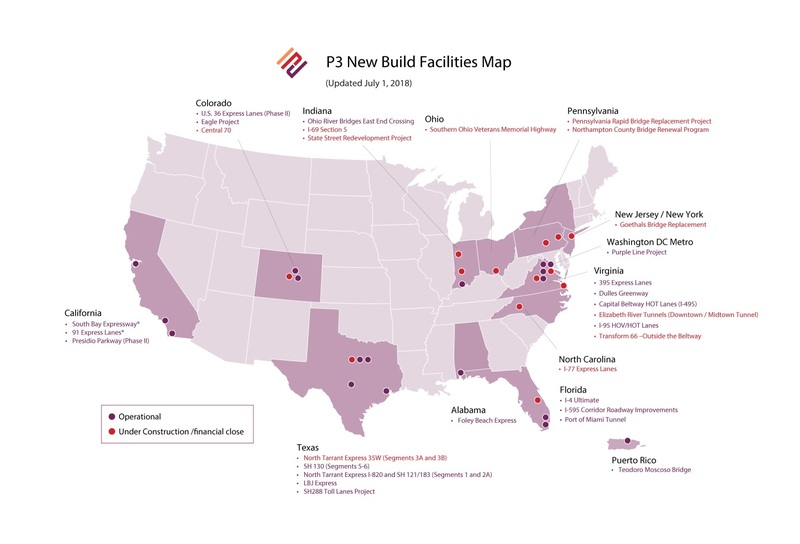 Many major P3 industry players now have related entities who specialize in concessionaire financing.1 Access to in-house financing expertise and relationships lowers the cost of raising capital inherent in most P3 projects. Whereas smaller contractors will need to find and team with a financier (who will expect to take their own profit and overhead cut from any contract ultimately awarded), major contractors will be able to turn to a known and experienced team, whose profit and overhead expectations should be lower than an outside financier, given the role the captive concessionaire is intended to play. Put differently, the captive concessionaire should be satisfied with breaking even, provided that their work enables the related contractor entity to win the project. 2. Selective Sureties Limit Viable Players. Most P3 projects continue to require bonding by the contractor. Sureties learned some hard underwriting lessons during the 2008 crash, and bond program size restrictions, project size restrictions, and project-level underwriting are still rigorous among the major surety companies. The result is that even global contractors find it necessary to form joint ventures to pursue P3 projects, so that the bonding and indemnity obligation is spread among the carrying capacity of several different contractors. The restrictions are necessary from the sureties’ point of view—they expect indemnity opportunities that equal or exceed the quantum of the bond they are posting, and few contractors of any size can comfortably guarantee an indemnity recover of $1 billion or more. These same restrictions will create very difficult barriers to entry for regional contractors. It’s one thing for 3 global contractors to JV together to pursue a $1 billion project—there should be sufficient money to cover each partner’s overhead expenses and profit expectations. If six regional contractors have to JV together to pursue the same project, the odds of each of them getting sufficient profit and overhead recovery to justify the effort is significantly smaller. Every time you cut the pie, you lose some to crumbs. The more times you have to cut the pie, the more you lose. Surety underwriting restrictions will continue to benefit global contractors at the expense of regional contractors. 2. Design-Build Delivery Presents Barriers to Entry. Most P3 projects are delivered via design-build, with varying degrees of involvement/restriction by the owner and its consulting designer. While the design-build delivery mechanism is a natural fit for P3 projects, its use has at least two predictable results. First, design-build delivery for projects of typical P3 size can only be designed by a handful of design firms. With prime design contract values exceeding (often far exceeding) $50 million for designs to be delivered within a narrow time window (again, often 18 months or less), even major national design firms find it necessary to partner with competitors to deliver designs on-time and on-budget. Based purely on available manpower, even significant regional design firms will find themselves unable to muster the resources necessary to serve as the prime designer. The issue of risk raises an even thornier problem. Contractors teaming with designers pre-bid often expect designers to assume some risk arising from their preliminary, pre-bid design development. Depending on what the parties actually agree to, this risk can easily run into 8 figures, a result that would bankrupt all but the top tier of designers nationally, and which makes these projects unpalatable many companies who would otherwise be qualified and capable of executing them. Second, the perils of bidding on a design-build P3 justifiably scare away many contractors who would otherwise be able to perform the work. The owner and financier/concessionaire aggressively (and often successfully) downstream virtually all the risk associated with the execution of the project. Since many P3 projects continue to be primarily heavy civil, horizontal work, project-side risk is formidable, hard to precisely quantify, and opportunities for mitigation are frequently minimal. Those firms who have built expertise in the past 20 years are well-positioned to leverage that experience to maintain places of prominence even as the market expands. 3. The P3 Bidding Process Allows Owners to Pick Favorites. P3 projects, in contrast to traditional sealed, lump-sum, design-bid-build projects, need not be awarded to the lowest responsible bidder. Rather, P3 projects are usually awarded on an RFP basis, in which price is only one of the factors considered. While the award must still be made based on an objective evaluation of known criteria, the owner is left with a great deal of discretion in its decision. Once again, incumbency and experience means that the rich are likely to get richer. In an RFP competition between a national contractor who has executed a dozen prior P3 projects and a regional contractor who has never executed a P3 project before, the owner can scarcely be faulted for awarding to the more experienced contractor. 1 As just one example, Hochtief Solutions AG is the captive concessionaire entity for the Hochtief/Dragados family of companies.